I bet the title of this recipe made you do a double take. But it’s a bit of a no-brainer really, as tahina and Marmite both have that kind of umami thing going on. And tahina is awfully like peanut butter, which is on kissing terms with Marmite. So there you have it. Mrs.S. is a Marmite lover anyway, and making 12kg of plain houmous each week can be pretty tedious, so it was only a matter of time before she created this. It is, frankly, sensational. And even if you’re a hater rather than a lover the ingredients have a synergistic effect on each other so you should totally give it a try anyway. 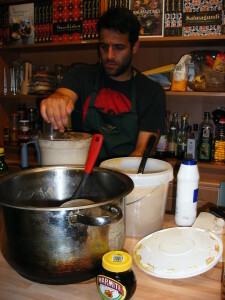 We actually got Junior (aka Mr.S.’ kid brother) to make the houmous this time as he is getting hitched in less than a fortnight and we have been working on his domestic skills portfolio for weeks. The boy done OK. The most important thing about houmous is that you eat it fresh. I write as someone who has worked her fair share of Mediterranean kitchens: anything that could be made ahead in big batches always got my vote. This recipe isn’t one of them; after a night in the fridge it can start to acquire a tang. 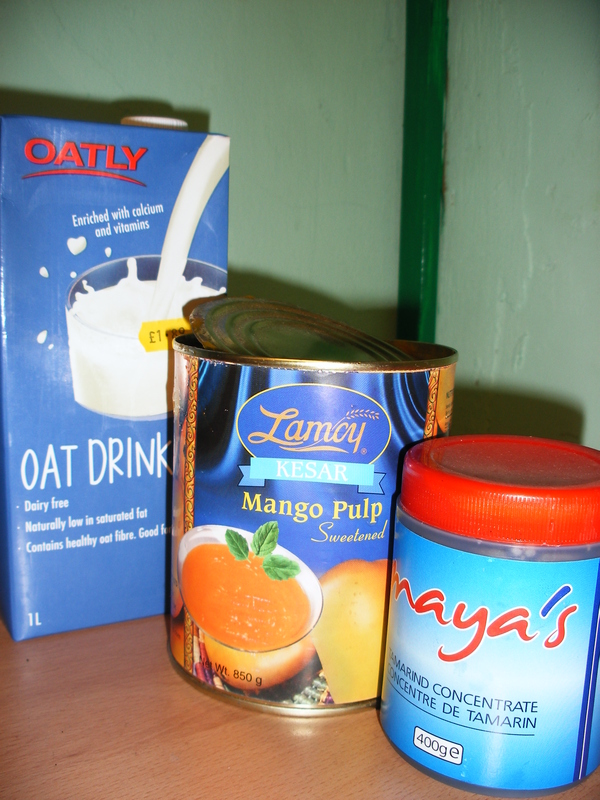 I would also advise against cheating by using canned or jarred chick peas – they never have the same flavour. I actually like houmous while it is still slightly warm. Right. Reserve a handful of soaked chick peas, put the rest in a pan, cover them with (UNSALTED) water, add the bi-carb and bring them to the boil. Turn down the heat, allow to bubble for around ten minutes and then skim off any foam or detritus that has risen to the top. Cook for a further hour or until they are soft and can easily be squidged between finger and thumb. Do not drain, but remove the pan lid and leave them somewhere for half an hour or so to cool a tad. You can do the next bit by hand – but it is so very much easier with a blender. Ladle about half of the still warm chick peas into the blender goblet, including quite a bit of the stock. Add half of the tahina, Marmite, olive oil, lemon juice and garlic, and blend until smoothish, adding more of the stock if the mixture is too solid. Repeat with the rest of the ingredients, and then mix the two batches together well and season to taste. Heat a little olive oil in a pan and fry the remaining chick peas, stirring constantly, until they are golden and crisp to bite. Drain them on a piece of kitchen towel and then roll them in a little salt. Serve the houmous on a plate/s – if you bash the bottom of the plate against the palm of your hand the dip will spread evenly across the surface. Sprinkle the fried chick peas across the houmous, and follow it up with a pinch of paprika. Serve as a dip (with Marmite toast soldiers, of course) or a sauce or a sandwich filling (with plenty of cress). This entry was posted in Recipes and tagged Junior, Marmite, Marmite houmous, toast soldiers, umami on September 26, 2014 by Sally Butcher. Firstly: for those of you are fasting – Ramadan Mobarak! Yesterday was the first of Ramadan for most Muslims. Whilst it is the month of fasting, it is also a month focused very much on food, and many of the recipes in Snackistan are based on the idea of iftar, or breaking fast. The following recipe is more comfort food than anything else, although my mother-in-law makes it so quickly that it is truly a snack soup. It is astonishingly good any time of the day, but (I imagine) especially appetising if you have not eaten ‘owt else all day. Mix the lamb with the grated onion, spices and salt, pounding well to get the lamb fat to soften. Roll the mixture into baby meatballs (around 2cm in diameter) and fry them (briefly, like for a few minutes) in a good splash of oil. Reserve, but leave the oil in the pan. Put the water in a saucepan, add the rice and bring it to the boil. After 7-8 minutes add the tomato paste and set to simmer. In the meantime fry the diced onion in the reserved oil. Just as it starts to brown, toss in the mint, stirring constantly, and cook until the onion is thoroughly browned and the mint just beginning to smoke*. Once the rice is soft (after about 15 minutes) and the liquid reduced to a little under than a litre, lower the fried meatballs into the bubbling stock. Use a slotted spoon to scoop out the fried onion/mint mixture (allowing any excess oil to drain back into the pan) and add this to the stock ‘n’all. Finally add verjuice or lemon juice to taste, and pepper as required. The tomato paste and the seasoning in the kufteh should offer sufficient salt – but chuck some more in if your are a regular salt pot like Mr. Shopkeeper. Bubble the mixture for another 5-6 minutes before serving with warm bread. *This is a famous garnish or seasoning in Iran and you will find it added to all sorts of soups and stocks. It is called ‘piaz dagh’. 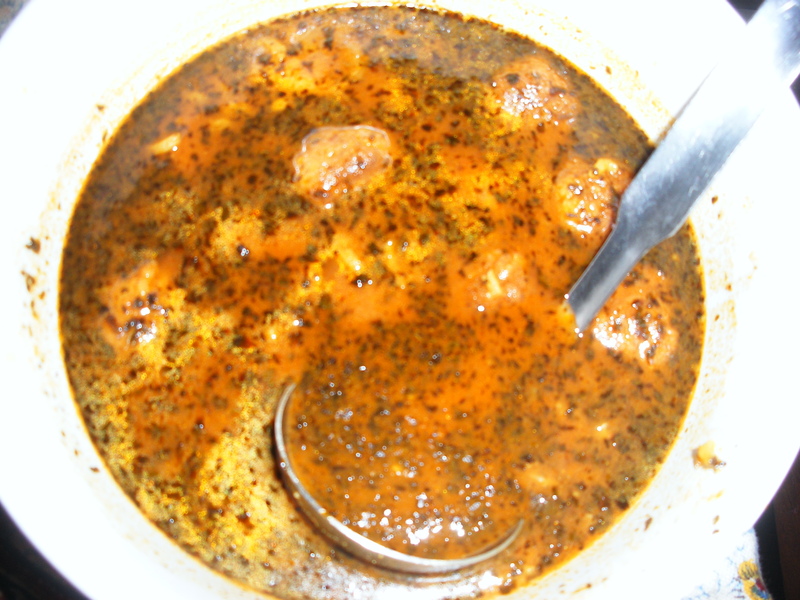 This entry was posted in Recipes and tagged breaking fast, iftar, kufteh soup, meatballs, ramadan recipes on June 30, 2014 by Sally Butcher. The kebab is supposed to be named after shepherds (chopan) who rubbed chunks of lamb on the bone with plenty of salt, skewer the meat on twigs or small branches, and roast them over fire while watching their flocks. Mix the yoghurt with one of the onions, plus the garlic, coriander, oil and seasoning. Add the lamb chops, rubbing the marinade in with your hands, before covering and leaving in the fridge for at least 2 hours, if not overnight. When you are ready to cook, heat your coals. Shake the marinade from the cutlets and then thread them onto skewers interspersed with strips of pepper. Sprinkle with a little extra salt if you’re a salt-head like Mr. Shopkeeper. Then thread the remaining onion, tomato and shrooms on another skewer. Cook the lamb sticks for around 3 minutes a side – and the vegetables for around half that time. Serve with warm bread and thick yoghurt. Noshe Jan! As we say in Peckham. Enjoy! 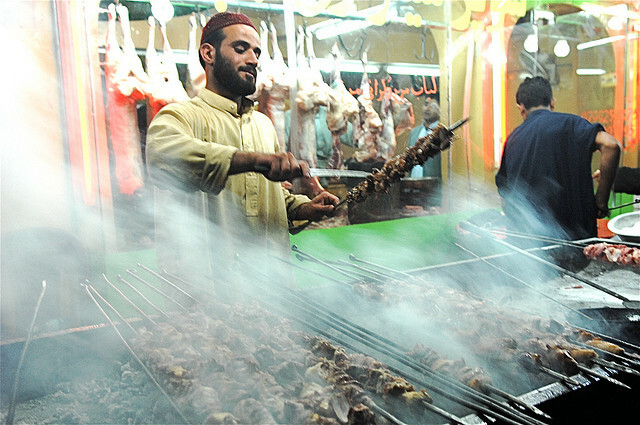 Action ‘meat-on-sticks’ shot captured by Afghanistan Matters via Flickr under the Commercial Commons Licence for Commercial Use. 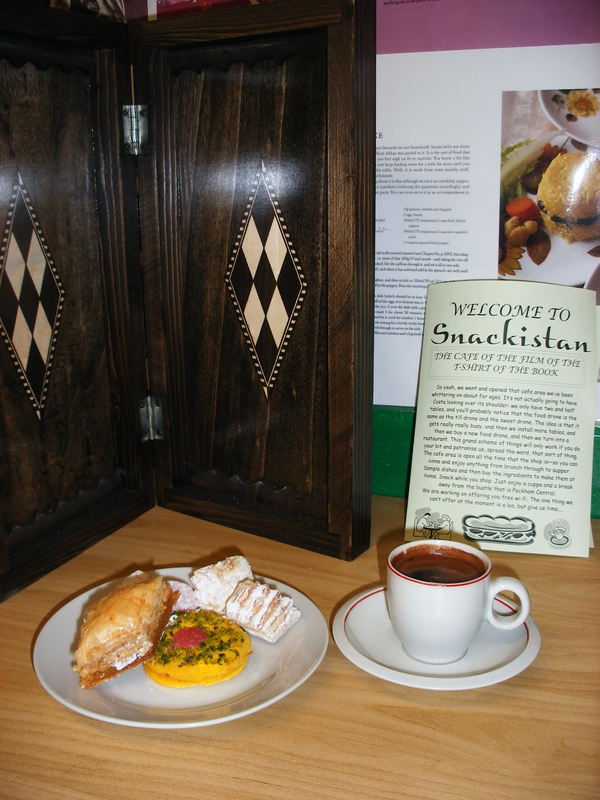 This entry was posted in Postcards from Snackistan, Recipes and tagged Afghanistan, BBQ, Chopan Kabob, meat on sticks, photo of the month on May 18, 2014 by Sally Butcher. This was an experiment in our deli counter (and we do like experimenting on our customers). A rather successful one. So we thought we’d share it with you. A super-simple cupboard staple party dip which could double as an accompaniment to sausages, a filling for jacket potatoes or a sandwich spread. Perfect Snackistan fare in other words. Blend the first two ingredients thoroughly, and stir in everything else. 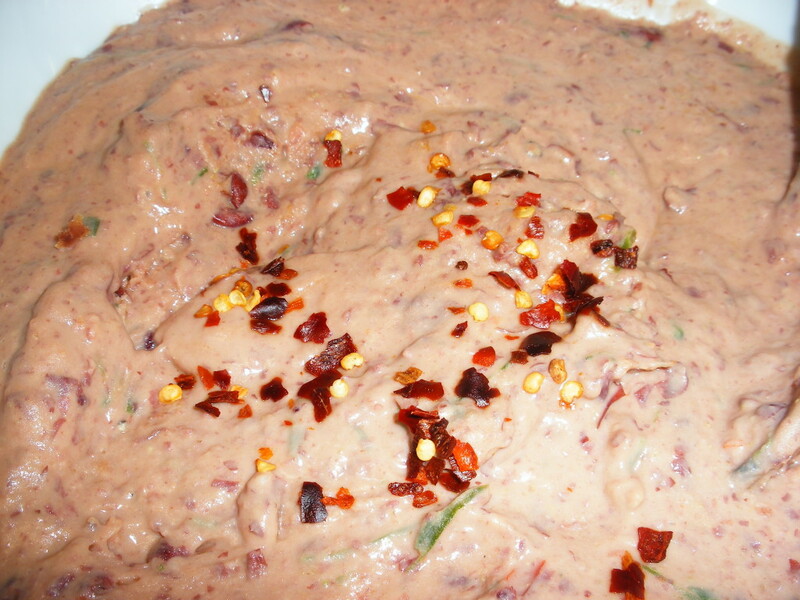 This entry was posted in Recipes and tagged dips, labneh, red kidney beans on March 30, 2014 by Sally Butcher. It all started with a roast garlic recipe. Of which more elsewhere. Anyway, Mrs. Shopkeeper hadn’t had any lunch today. And she had some leftover ‘vegetable dressing’. So she made a milkshake. Yes sirree. Because that’s the weird kind of chick she is. Turns out the shake was so filling that she is still full, a good two hours later. SO this is a real fatboy of a snack drink. And you can have it hot or cold: a smoothie for all seasons. Really easy. Blend all the ingredients together. To enjoy warm, er, well, just warm it up in a wee saucepan. Reckon a drop of brandy would be a nice addition, although clearly Mrs.S. didn’t have any in her liquid lunch today as you need all your faculties to drive a shop. This is so good we are considering adding it to our new Snackistan Cafe menu. Did we tell you that Snackistan is actually a real place now? Swing by and snack some day: it’s open all the hours that the shop’s open. 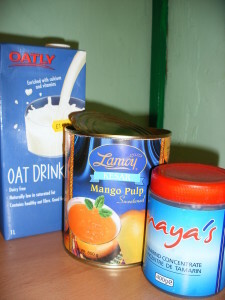 This entry was posted in Recipes and tagged ginger, mango, smoothie, tamarind, The Snackistan Cafe, vegan smoothies on February 26, 2014 by Sally Butcher. To celebrate the opening of our own little real-life Snackistan (cafe, in the shop, two tables only – so don’t go getting too excited) we’ve been playing around with some new wraps and sandwich fillings. And I reckon this might be a contender for one of the best ever. Mr. Shopkeeper reluctantly agreed it was pretty good, but would prefer added smoked chicken, or perhaps some char-grilled sirloin. Hmm. In the recipe below it is delightfully vegan and (potentially) gluten free. This is kind of refried beans, but with a Middle Eastern slant. Black-eyed beans are my favourite of all pulses as they have such a wonderful innate flavour all of their own. They are inexpensive, and don’t need soaking, and they look so silly that they always raise a smile (it’s the little things, right?). 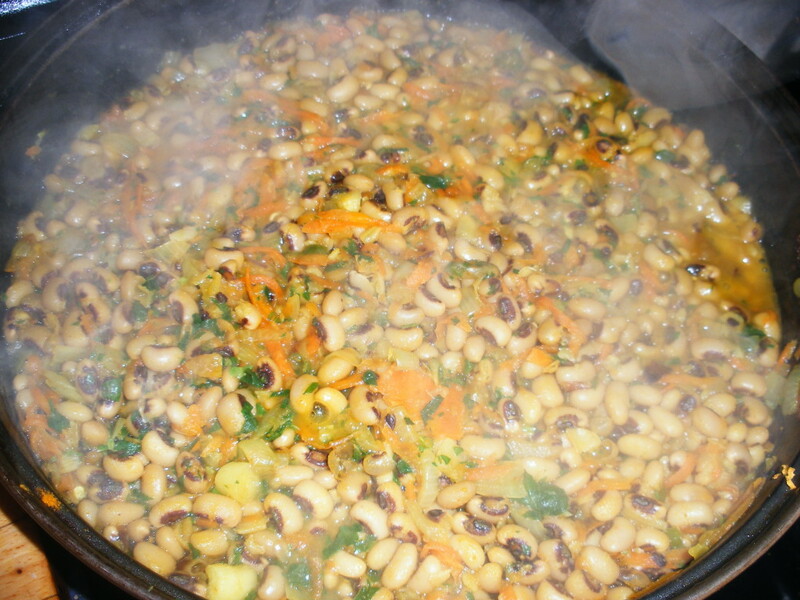 Simmer the beans in a pan of water for around 40 minutes, or until well cooked. Drain, keeping just a soupcon of the cooking water. Next heat a good slug of olive oil in a skillet and fry the onion, celery and carrot: once they start to soften, add the garlic and chilli, followed by the turmeric, stirring well. Add the lemon juice together with 4-5 tablespoons of the reserved cooking stock, cover the pan and bubble on a low heat, stirring occasionally, for about fifteen minutes (adding more stock if necessary). At the end of this period use a wooden tenderiser or masher to pound the beans: you just want to break them down without actually mashing them. The mixture should be good and moist without having any visible stock to drain. Salt the beans to taste, and then chop half of the bunch of parsley and stir it in. Next mash the avocados with the spices and yoghurt and season to taste. 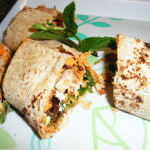 To assemble the sarnies, dollop a goodly spoon of the bean mixture on each wrap, stripe with the avocado and add a handful of the remaining parsley. Roll and devour. They also toast very well. Mix 110g gf flour (or 55g gram flour & 55g gf flour) 1/4 tsp xanthan gum (essential), salt, 1 tbsp oil, 4-6 tbsp warm water: sift, pour over oil & water and pull together into smooth dough. Griddle them over high heat for 3 mins each side. Makes 2. This entry was posted in Recipes and tagged refried black-eyed beans, sandwich bar, spiced avocado, wraps on January 29, 2014 by Sally Butcher. 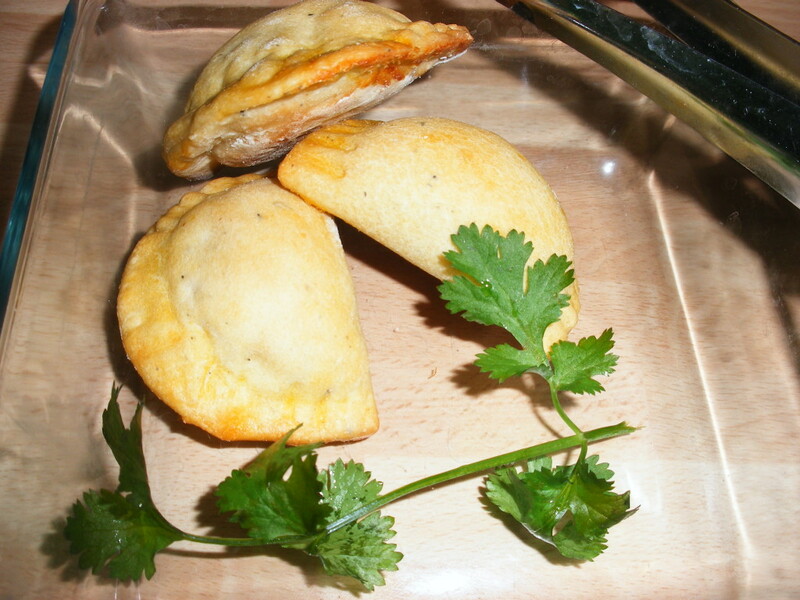 These are very similar to the Levantine pastries in the Snackistan book, but slightly softer, with a wonderfully moreish cheese filling. Mr. Haddad is our Lebanese baker; his company, Dina Foods, is one of the best known producers of sweet and savoury pastries and bread in South East England. Trouble is, he cooks for about five thousand people a day, and he is very busy, so eliciting a recipe from him requires patience, and a calculator to downscale the thing for domestic use. We also had to blackmail his (very lovely company accountant) wife by bringing our account up to date (not that it is ever very much behind) before she would allow us to have the recipe. The things you have to do to write a book. Dissolve the yeast and sugar in the warm water and put it aside for ten minutes. Sieve the flour and salt into a mixing bowl and make a well in the middle. Now add the yeast water combo, mixing with a wooden spoon: once the ingredients come together, add the margarine, working it in with your hands. Form the dough into a ball, and roll it in a little oil to keep it moist. Cover it with a damp cloth and leave somewhere warm for a couple of hours to prove. 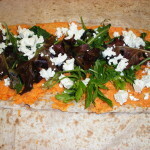 Assemble the filling by crumbling the cheese and then mixing in all the other ingredients together with a wooden spoon. Set aside until ready. When the two hours are up, knead the dough on a floured surface for a good five minutes, and then divide it into fifteen balls. Leave it to rise for a further quarter of an hour, then pull them into small flat rounds with your hands and spread them out on one or two oiled baking trays. Spoon a little of the cheese mixture on to one half of each of the pastry circles, and then fold the other half over, crimping the dough with wet hands to seal it. Beat the egg with the milk and use a pastry brush or piece of kitchen paper to glaze the pastries. Heat your oven to gas mark 5 (200˚C), and when it is hot cook the sambosic for 15-20 minutes, or until they are lightly browned. These will keep in the fridge for several days, and can be eaten hot or cold. This bread/pastry is kinda soft, and so can also be warmed in a microwave. This entry was posted in Recipes and tagged cheese sambosic, pie on October 18, 2013 by Sally Butcher. Ah: the Jemaa el Fna. You know what? When I first laid eyes on it by day I did that silly hand-flappy thing that girls do when they get over-emotional/excited. And, even more embarrassingly for the step children, my eyes filled with tears. It is the most awesome living film set on earth (although I have, admittedly, still got quite of lot of the earth left to see). So you can imagine my excitement when we visited it at night… Even the normally placid Mr. Shopkeeper was impressed (there he is in the picture: give him a little wave). For by night it is just the biggest street food fest: stall upon stall upon stall of grilled meats and fresh breads and freshly squeezed juices competing in a riot of colour and spectacle and sound and aroma. It was possibly out of this brief-but-wonderful visit that the (roasted and salted) seeds of Snackistan were planted. It was certainly where we got to try boulfaf. This lovely dish is mostly eaten during Eid-al –Adha, or the ‘Feast of Sacrifice’, one of the big Islamic festivals which celebrates both the end of the month of pilgrimage, or hajj, and the sacrifice that Abraham was prepared to make (ie that of his son) in the name of his love of Allah. Rich families across the Muslim world buy and slaughter sheep (just as Allah provided a sheep for Abraham to kill in place of his own son) to share with their relatives and the poor of the neighbourhood: in Morocco a number of dishes are traditionally made from the sheep, and this is perhaps the simplest and tastiest. 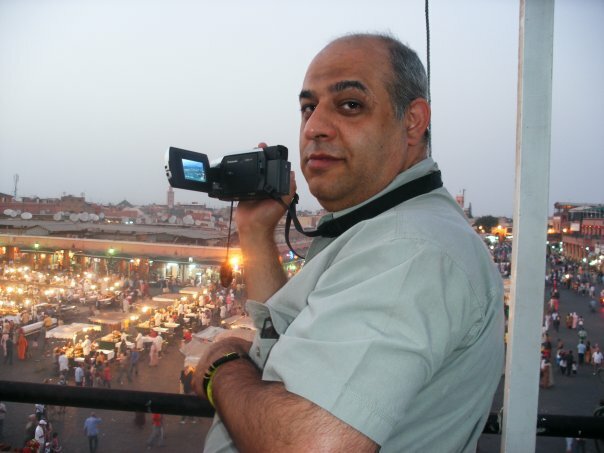 It is hugely popular street and souk food. Firstly fire up the barbie. You can cook this under a regular grill – but pop your extractor fan on as the melting fat produces smoke. You can also ditch the skewers and bake the liver instead. ‘Peel’ the liver i.e. remove the outer membrane, and cut it into 3cm cubes. Mix the spices and seasoning together, and then shake half over the lamb cubes, turning them to attain even distribution. Stretch the caul fat out and then cut it into 6-7cm squares roughly commensurate with the number of cubes of liver that you have (left over liver should be given to the cat). Sprinkle the rest of the seasoning over the fat, and then place a lump of liver on top of each square. Pull the fat up around each cube: you will find that it sticks to itself (would that gifts were that easy to wrap). Thread 4-5 lumps of liver on to a skewer and repeat until all the meat has been used up (you’ll need around eight skewers, or you can just wash and recycle them a bit sharpish). Grill for around 5 minutes a side: the liver should be just a little pink in the middle. If you are baking your boulfaf, about twenty minutes at gas mark 5 (190˚C) should do the trick. Serve with loads of lemon wedges and warm flat bread. Moroccans reckon the best accompaniment for this is mint tea, and who are we to argue? *Not worked with caul fat before? It is just so very useful (albeit weird) as it stretches seemingly endlessly, and is more or less self-sealing, like a kind of edible cling-film. It is a great way of keeping loose meat ingredients together (sausages, minced meat), and is also handy for barbecue aficionados, as it seals and bastes delicate meat as it cooks. It is readily available from good independent butchers, both halal and otherwise. This entry was posted in Recipes and tagged boulfaf, caul fat, Jemaa el Fna, kebabs, liver, Marrakech on July 15, 2013 by Sally Butcher.